One of the joys I’ve discovered through launching this new start up is all of the fascinating people I get to meet along the way. This group is no exception. 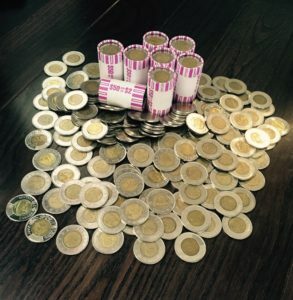 I met each of them at different stages of the journey – one was part of a young leadership team that I presented to; one is a long time friend who I now get to work more closely with; and another is the actual bank teller that helped me withdraw the 365 toonies this past summer. They are all part of our Givesome Ambassador team at the University of Guelph. What’s a Givesome Ambassador? Someone who believes in what we’re doing, wants to help us share Givesome with others, helps support some of our student based initiatives and who are generally well rounded awesome people. You will be hearing from some of them in the coming weeks as we let them share about their personal experiences with giving – what they like and don’t like, what they want more of, what they’ve been learning, how giving has impacted them in some way. We all have a unique story and we’re looking forward to sharing some from those we’re quite fond of. If after reading you’d like to share your own story of some aspect of giving, or if after hearing of the forming of a Givesome ambassador team you are mildly intrigued, you know where to find us. We’d love to hear from you. next post: Want to be in our video?